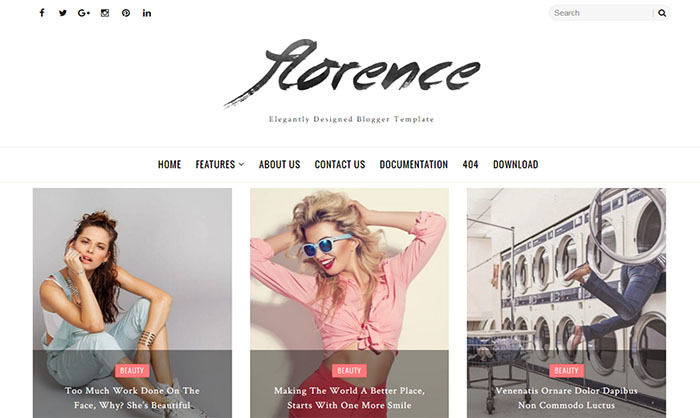 Florence Blogger Template is a light weight and fast loading template with very clean, minimal and elegant responsive layout. This template is perfect choice for Travel bloggers, lifestyle and fashion bloggers, stylish female entrepreneurs, a business or personal. From Fashion, to Food, to Photography, this multipurpose template will fit any blog niche. it has a clean and simple design tailored with perfectly optimized coding. with lots of pre-installed widgets Florence enhance your blog properties and improvise your content so that you can connect with your visitors easily.